SQL Server Data Tools (SSDT) provides, via the DacPac, interesting support for verifying not only those references within the database, but also those to other databases even if they are on other servers. Although it is adds an extra level of complexity to deployments, it can increase the probability that deployments will succeed without errors due to broken references or binding errors. When you have code in a SQL Server database, the only guaranteed way to know whether the code will run is to actually run the code. Of course, there are certain checks when you deploy code to a SQL Server database: The server will check whether any columns exist on tables used by the code you are deploying exists but if a table does not exist it allows the code to be deployed and further those objects could be altered or subsequently dropped so that the code no longer works when you run it. There are other problems too: Checks on dependencies aren’t made, for example, during build if a procedure references a missing table. SQL Server Data Tools (SSDT) attempts to help developers by validating that any code that references an object will run when it is called. This means that every time the project is built, any reference to an object is validated to ensure that the object exists, and that the way it is used is correct. You can even work the same trick with functions or views as well by subsequently dropping the correct table and then creating a faulty table. 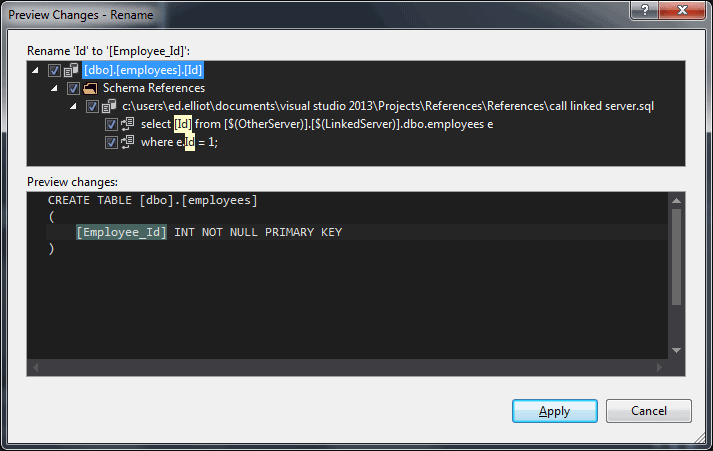 Could not use view or function 'employee' because of binding errors. In this case SQL Server would have happily created the table, the view and then the new version of the table. Both these errors would break a deployment despite there being no errors during the actual deployment process. What SSDT does in this case is see that the stored procedure or view has a reference to employees and it is using the three non-existent columns but because they do not exist, SSDT can create a warning that the code is not valid. This is great when you have the code that you will call within your SSDT project; but what if it needs to validate something outside the SSDT project such as “select [whoopsie] from sys.sysprocesses” or “select wrong_column from otherdatabase.dbo.employees”. The code for the system DMVs or another database would not be in your project because your project only contains the code for your database. What would happen if you had a linked server pointing to an AS/400 where the files referenced could not be put in your project as they are in a whole different SQL dialect? The answer for SSDT projects is database references. 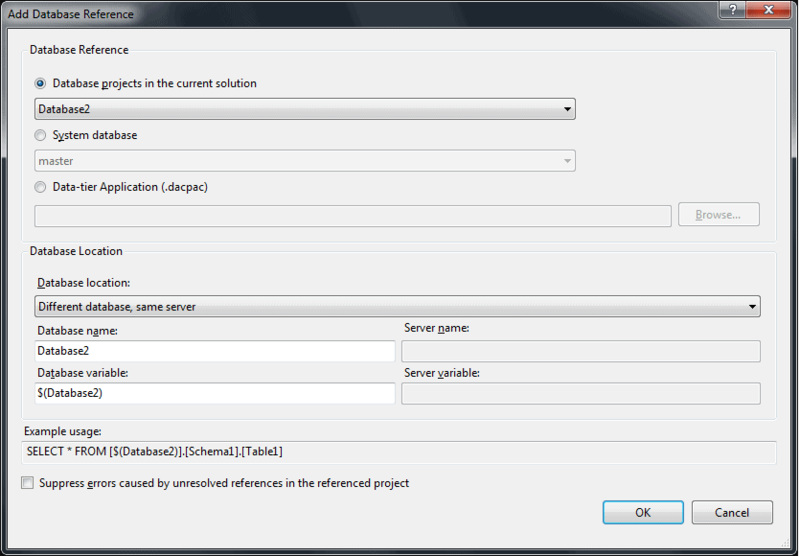 Database references allow SSDT to validate that the code that you call in your project is valid because even though the system DMVs or other databases do not exist in your project, there is a DACPAC (Data-tier Application Component Package) which contains a model of the relevant objects of those databases which is used to validate that the model in your database is correct. What happens if you get a warning? If you import a legacy database into SSDT you may find that you get a lot of these error so you could leave this disabled but aim to have it enabled at some point. We can also quickly jump from the stored procedure that uses the table to the table definition by putting the cursor over the table name and pressing ctrl+b or right-clicking and choosing “Go to Declaration” so it makes developing fast, there is certainly no need to find the table in object explorer and script out the definition. Other SSDT projects in the same solution are the simplest form of database reference, you have your code in one project and you call it from another one. The two system databases are simply extracts of the master or msdb databases put into DACPACs. To help support different versions of SQL Server, SSDT actually ships with a version of master.DACPAC and msdb.DACPAC for each version of SQL Server including Azure that SSDT supports. The last type allows us to reference a pre-compiled SSDT project in the form of a DACPAC which is useful as you can manage dependencies really quite simply. For example in my SSDT projects I have a unit test project and that references tSQLt, I don’t have to deploy tSQLt for every new project I set up, I simply add my pre-built tSQLt.DACPAC as a reference in the unit test project and then I can start using the tSQLt procedures directly. Unless we have a DACPAC when we use linked servers to reference other databases, we will have to disable the option of treating T-SQL warnings as errors: This is not good, since we are losing the major benefit of SSDT. If we are in this situation, it is often preferable to create a dummy DACPAC with the skeleton versions of objects we are calling in our project. There is a risk that the skeleton project is incorrect but that is unlikely and can be fixed fairly easily. References to the system databases, master or msdb are automatically set to “Different Database, Same Server” but the objects are available to reference using Schema.Object as they are treated as special cases. There is an option (DropObjectsNotInSource) that you can use which deletes any objects which are in the target but which are not in the source. This is a really useful way to make sure that the objects that you remove from your code are actually dropped from the database. If you do not have the option enabled your database fills up with old unused objects and backup objects which shouldn’t really be there so it is best to have this option enabled. When you deploy a DACPAC if you use “This Database” references to build up a database you need to deploy all of the DACPACs together which you can do by including the option IncludeCompositeObjects. This will silently merge all of the DACPACs together before comparing them all to the target database. If you do not use the IncludeCompositeObjects option then any objects in the referenced DACPACs will be dropped. If you are adding a “Different Database, Different Server” reference SSDT will create a Server and a Database SqlCmd variable. If you do not do this then you will get an error for each reference. When the code is deployed, the value of the variables are replaced with the values that you want to use for that deployment: This means that you can easily deploy the same code to different environments without having to have the same linked server and database names. How do you add references? Once you have chosen your target, you can choose the type of reference and create the variables that you need for the reference-aware statements. There is one final complexity with references in SSDT. References use the msbuild project system which means you cannot have a circular reference. SQL Server however has no problem creating a set of circular references. SQL Server does, however, allow circular references because a database is not deployed as a whole but as a chain of individual statements. If you have circular references, then you will need to identify the code that references the other projects but is not called by the other projects. 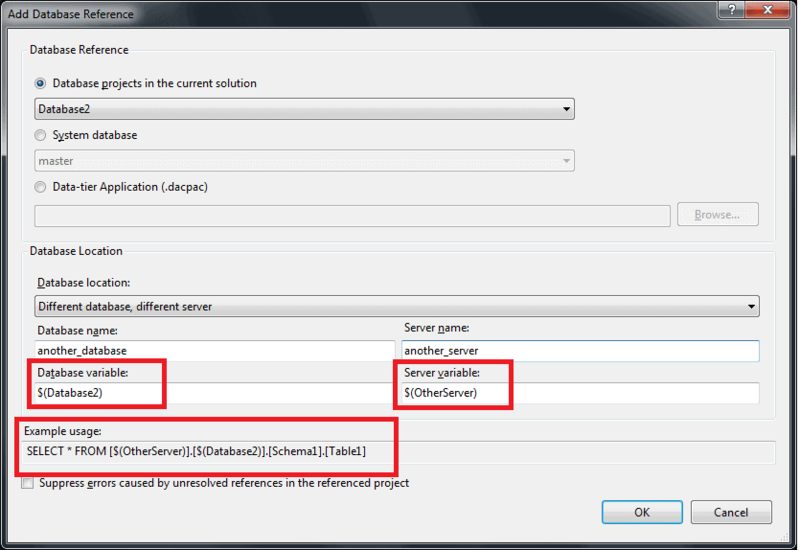 These must then be moved into separate SSDT projects so you can then use “This References” to deploy them together. References in SSDT add an extra level of complexity to manage. In return, they provide a lot of benefits in terms of the resilience of your deployments. Once you have your code in SSDT and compiling, you should then find it easier to start refactoring out the cross-database calls where possible. Where it is not possible to remove them you will still be able to get the benefits of using SSDT. Redgate is working on some tools to help with SSDT development. We’d love to know more about how you use SSDT and what problems you face. Please visit our page on the Redgate site to learn more, help us to learn more about your SSDT requirements, and sign up to help us with the beta. "I’m sad to announce that we’ve taken the really tough decision to discontinue work on the SSDT Extensions project for now. The primary reason is that we couldn’t find a significant enough problem to solve for you. Reference Data Manager didn’t prove as useful as we’d hoped, and our research didn’t reveal any other major areas where we could improve on SSDT."